Restrictive cardiomyopathy refers to a set of changes in how the heart muscle functions. These changes cause the heart to fill poorly (more common) or squeeze poorly (less common). Sometimes, both problems are present. In a case of restrictive cardiomyopathy, the heart muscle is of normal size or slightly enlarged. Most of the time, it also pumps normally. However, it does not relax normally during the time between heartbeats when the blood returns from the body (diastole). Although the main problem is abnormal filling of the heart, the heart may not pump blood strongly when the disease progresses. The abnormal heart function can affect the lungs, liver, and other body systems. 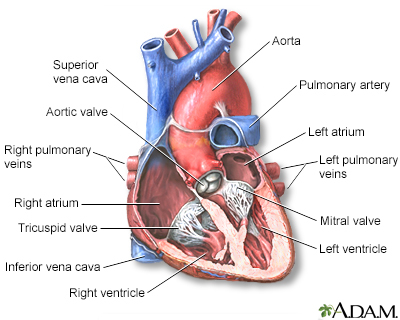 Restrictive cardiomyopathy may affect either or both of the lower heart chambers (ventricles). Restrictive cardiomyopathy is a rare condition. The most common causes are amyloidosis and scarring of the heart from an unknown cause. It also can occur after a heart transplant. Symptoms of heart failure are most common. These symptoms often develop slowly over time. However, symptoms sometimes start very suddenly and are severe. Restrictive cardiomyopathy may appear similar to constrictive pericarditis. Cardiac catheterization may help confirm the diagnosis. Rarely, a biopsy of the heart may be required. Myocardial biopsy is the removal of a small piece of heart muscle for examination. The condition causing the cardiomyopathy is treated when it can be found. Few treatments are known to work well for restrictive cardiomyopathy. The main goal of treatment is to control symptoms and improve quality of life. 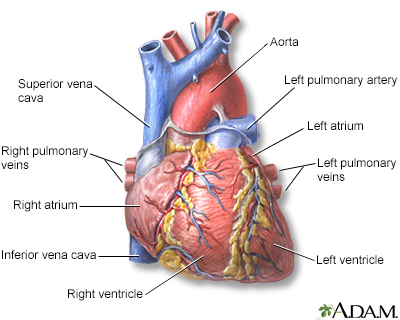 A heart transplant may be considered if the heart function is very poor and symptoms are severe. A heart transplant is surgery to remove a damaged or diseased heart and replace it with a healthy donor heart. People with this condition often develop heart failure that gets worse. Problems with heart rhythm or "leaky" heart valves may also occur. People with restrictive cardiomyopathy may be heart transplant candidates. The outlook depends on the cause of the condition, but it is usually poor. Survival after diagnosis may exceed 10 years. Call your health care provider if you have symptoms of restrictive cardiomyopathy. Falk RH and Hershberger RE. The dilated, restrictive, and infiltrative cardiomyopathies. In: Zipes DP, Libby P, Bonow RO, Mann DL, Tomaselli GF, Braunwald E, eds. Braunwald's Heart Disease: A Textbook of Cardiovascular Medicine. 11th ed. Philadelphia, PA: Elsevier; 2019:chap 77. McKenna W, Elliott P. Diseases of the myocardium and endocardium. In: Goldman L, Schafer AI, eds. Goldman-Cecil Medicine. 25th ed. Philadelphia, PA: Elsevier Saunders; 2016:chap 60.